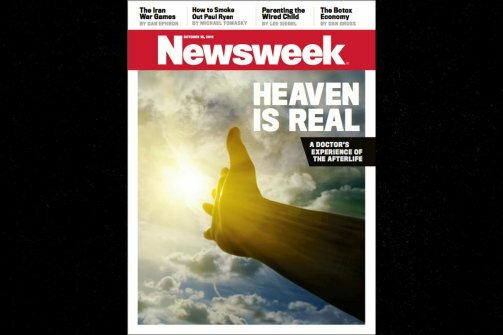 In Proof of Heaven: A Neurosurgeon’s Journey into the Afterlife, Dr. Eben Alexander says there is a heaven, a God, and it’s a magnificent place. Alexander explained in detail how an angel guided him through a vivid world of color, flowers, beautiful music and unprecedented Love. God’s Presence was was felt and was represented by a brilliant Light. "I was rescued by this beautiful, spinning, white light that had a melody, an incredibly beautiful melody with it that opened up into a bright valley," Alexander said in a recent interview from his home in Lynchburg, Va. with ABC’s Nightline. 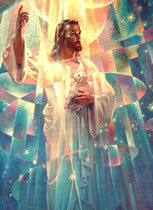 The message sent back from heaven was that he was loved, cherished and protected, there was nothing to fear. In the life to come, heaven will not only be welcoming, but God will fill you as well with His everlasting Love. 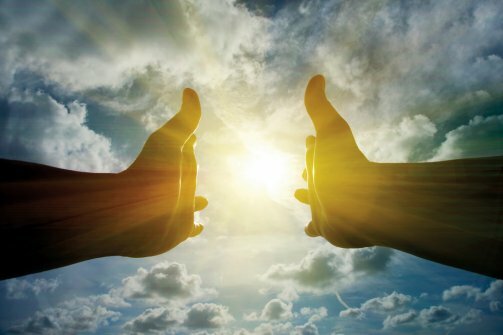 When a neurosurgeon found himself in a coma, he experienced things he never thought possible — a journey to the afterlife. But that dimension — in rough outline, the same one described by countless subjects of near-death experiences and other mystical states — is there. It exists, and what I saw and learned there has placed me quite literally in a new world: a world where we are much more than our brains and bodies, and where death is not the end of consciousness but rather a chapter in a vast, and incalculably positive, journey. It took me months to come to terms with what happened to me. Not just the medical impossibility that I had been conscious during my coma, but — more importantly — the things that happened during that time. Toward the beginning of my adventure, I was in a place of clouds. Big, puffy, pink-white ones that showed up sharply against the deep blue-black sky. A sound, huge and booming like a glorious chant, came down from above, and I wondered if the winged beings were producing it. Again, thinking about it later, it occurred to me that the joy of these creatures, as they soared along, was such that they had to make this noise — that if the joy didn’t come out of them this way then they would simply not otherwise be able to contain it. The sound was palpable and almost material, like a rain that you can feel on your skin but doesn’t get you wet. Seeing and hearing were not separate in this place where I now was. 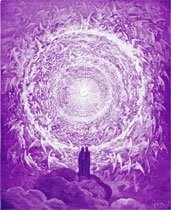 I could hear the visual beauty of the silvery bodies of those scintillating beings above, and I could see the surging, joyful perfection of what they sang. It seemed that you could not look at or listen to anything in this world without becoming a part of it — without joining with it in some mysterious way. Again, from my present perspective, I would suggest that you couldn’t look at anything in that world at all, for the word “at” itself implies a separation that did not exist there. Everything was distinct, yet everything was also a part of everything else, like the rich and intermingled designs on a Persian carpet ... or a butterfly’s wing. It gets stranger still. For most of my journey, someone else was with me. A woman. She was young, and I remember what she looked like in complete detail. She had high cheekbones and deep-blue eyes. Golden brown tresses framed her lovely face. When first I saw her, we were riding along together on an intricately patterned surface, which after a moment I recognized as the wing of a butterfly. In fact, millions of butterflies were all around us — vast fluttering waves of them, dipping down into the woods and coming back up around us again. It was a river of life and color, moving through the air. The woman’s outfit was simple, like a peasant’s, but its colors — powder blue, indigo, and pastel orange-peach — had the same overwhelming, super-vivid aliveness that everything else had. She looked at me with a look that, if you saw it for five seconds, would make your whole life up to that point worth living, no matter what had happened in it so far. It was not a romantic look. It was not a look of friendship. It was a look that was somehow beyond all these, beyond all the different compartments of love we have down here on earth. It was something higher, holding all those other kinds of love within itself while at the same time being much bigger than all of them. Without using any words, she spoke to me. The message went through me like a wind, and I instantly understood that it was true. I knew so in the same way that I knew that the world around us was real — was not some fantasy, passing and insubstantial. Each time I silently put one of these questions out, the answer came instantly in an explosion of light, color, love, and beauty that blew through me like a crashing wave. What was important about these blasts was that they didn’t simply silence my questions by overwhelming them. They answered them, but in a way that bypassed language. Thoughts entered me directly. But it wasn’t thought like we experience on earth. It wasn’t vague, immaterial, or abstract. These thoughts were solid and immediate — hotter than fire and wetter than water — and as I received them I was able to instantly and effortlessly understand concepts that would have taken me years to fully grasp in my earthly life. Later, when I was back, I found a quotation by the 17th-century Christian poet Henry Vaughan that came close to describing this magical place, this vast core that was the home of the Divine itself. "There is, some say, in God a deep but dazzling darkness . . . "
Before my experience these ideas were abstractions. Today they are realities. Not only is the universe defined by unity, it is also — I now know — defined by love. The universe as I experienced it in my coma is — I have come to see with both shock and joy — the same one that both Einstein and Jesus were speaking of in their (very) different ways. Dr. Alexander’s own brain was attacked by a rare illness. The part of the brain that controls thought and emotion — and in essence makes us human — shut down completely. For seven days he lay in a coma. Then, as his doctors considered stopping treatment, Alexander’s eyes popped open. He had come back.